Hooray! You managed to get off the long wait list and got yourself registered to attend the Le Diner En Blanc in Los Angeles on August 21, 2013. I can’t believe it. It looks like I’ll see you there. But hey, guess what? It’s not as easy as you think to find all the things you need to bring to the SECRET picnic. It’s also not so easy to find the perfect white outfit especially the white shoes (my dilemma was finding the perfect white high heel shoes). For me, it’s been one crazy roller coaster. However, the Organizers assured me that all the fuss will be worth it in the end. They added that Le Diner En Blanc will be the most extravagant, elegant, sophisticated food and wine French picnic that you’ve ever attended. I, for one thing, am up for a great exclusive French picnic party in L.A. The ticket gets you access to be a part of the large flash mob of diners who congregate to the secret Los Angeles area picnic location. Yep, I was easily convinced to sign-up after reading that over 15,000 attendees in Paris, France attend the various secret locations. The prior years included secret locations like Le Louvre, Le Arc de Triomphe, and Le Tour Eiffel and in other parts of the world like Barcelona, Spain and Singapore. From what I learned, Le Diner En Blanc has steadly taken over many U.S. locations like New York, San Francisco, Chicago, and Las Vegas. Since I wanted to be a part of the celebration, the excitement, and the festivities, I’ve accepted my fate to bear the extra leg work it takes to make my own experience at Le Diner En Blanc a memorable one. Below are the rules and info that I know of that will help you in planning for and attending the upcoming Le Diner En Blanc in Los Angeles. The dress code is super strict. Everything you wear must be white and fashionable couture. Feel free to make your own individual statement. If you want to dress in costume, you can but it has to be white. Those cool angel wings are appropriate. Every minuscule detail in your clothing and shoes must be white. Even your purse must be white, your belt, your sweater, etc. If you decide to wear flowers, it must be white. Panama Hats with a black band is not acceptable, but you could replace the band with a white one. If you have a little green in your shoes, you will be banned from attending. The sole of the shoe is sort of a catch 22, if the shoes is white, but the sole isn’t…it’s still a white shoe. Just in case, bring an all white shoe. I plan to bring white duct tape to help fix the imperfections in the tiniest of details of my outfits. Absolutely NO t-shirts, tennis shoes, no sweats, no shorts, etc. Again the dress code is chic, elegant, GQ, or sophisticated couture. 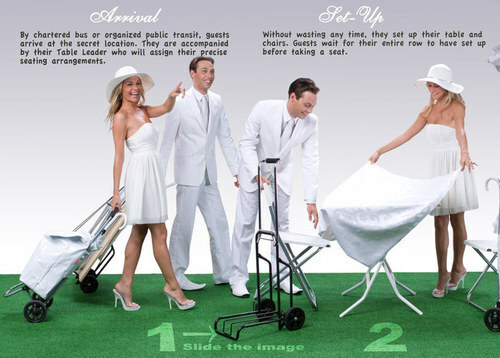 Note the Group Leaders, Bus Leaders/Table Leaders, and Pedestrian Leaders are the Fashion Police for Le Diner En Blanc. Whatever does not fly with them will prevent you from boarding the bus. The table and chair rules are very strict due to logistics. Your foldable table width must between 27 inches X 27 inches to 32 inches X 32 inches…No Exceptions. Even poker tables are not allowed, because they are too big. If your table does not meet the specifications, you and your guest will be barred from boarding the bus. There are plenty of ways to find your table. A few suggestions are Amazon, eBay, Target, Walmart, IKEA, Home Depot, Lowes, Office Depot, etc. I’ve seen foldable tables and tables-in-a-bag that are very reasonably priced for less than $60. There are even foldable bistro sets that are reasonably priced at under $125. Foldable chairs can also be found in the same places as mentioned above. If you prefer, you could always rent or borrow from a friend. All tables are to be covered with a white table cloth. If you care to decorate your table…Go for it! Okay, so you ask…“What if the folding chairs are not white?” Well, the rule of thumb is that you cover it with white cloth or white chair covers. Because this is an elegant event, your table setting must be elegant too, which means you bring real (not plastic or paper) white plates, silverware, wine glasses, and white cloth napkins. Feel free to decorate your table with a nice centerpiece, flowers. Scroll below for info regarding battery operated lights. You will also need to bring trash bags, because everything that comes with us, leaves with us when we depart the picnic location. Bring whatever your heart desires to eat during the festivities. Wine and Champagne are suggested, but beer and other spirits are not. Also make sure that you bring a bottle of drinking water. The only information we know about the SECRET location is that there is NO OPEN FIRE allowed, which squashes the use of sparklers, fire lit candles and tea lights. However, the best substitution for illuminating our tables and creating the elegant ambiance is to bring LED battery operated candles and tea lights. As for the substitution for sparklers, a good substitution are those plastic glow sticks, necklaces, and bracelets in white, of course. Many of these items can be found at Target, Bed Bath and Beyond, Walmart, and at any party supply store. Again, there is NO OPEN FIRE allowed at the secret picnic location. They would like that everyone arrive at the departure point at exactly 5:00PM, but no later than 5:15PM. Because of the typical L.A. rush hour traffic, I suggest that you hangout early at your departure area or be close to your vicinity to avoid being late. Find your Bus Leader. There will be up to 50 people total who will be in line to load the bus and find their seats inside. The bus will depart at exactly 6:00PM and it will leave without you if you are late. The bus will drop us off approximately one walking block from the SECRET picnic location. Yes, you have to CARRY all of your belongings. I suggest bringing something like a rolling luggage carrier or something with wheels to make things easier. Ladies, I suggest you wear white walking flats when you transport your belongings and change into your fancy white heels when you arrive at the picnic. They told us that this was okay. 5:30PM Bus loading and and seating. 7:00PM Arrival at picnic location. 7:30PM to 9:00PM Dinner time. 9:00PM Entertainment (music and dancing) begins. 11:00PM Departure is at 11:30PM. Yes, we party late so make sure you take the day off work the next day if needed. The cool part is that this year is Le Diner En Blanc’s 25th anniversary. I don’t know of any extra little surprises when we attend, but I now think that I ought to bring a birthday cake to celebrate the occasion. Bring your cameras to take plenty of photos! Absolutely no social networking during the event. This is to preserve the secrecy of our picnic. Think of it this way, you paid for your ticket to attend this secret picnic so let’s not allow for party crashers to ruin our event. Looking for more information about this?